Most Mac users like me are a great fan of the OS X Leopard Operating system and the styles it offers to everyone. 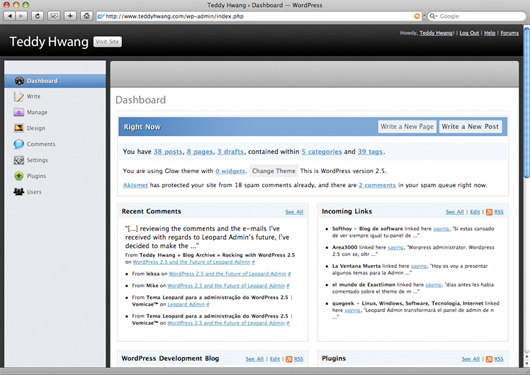 Since i blog through the WordPress CMS it would be great if we could convert the WordPress Dashboard look like the Mac OS X Interface and for this there is one readily available WordPress Plugin which once implemented would get everything done. 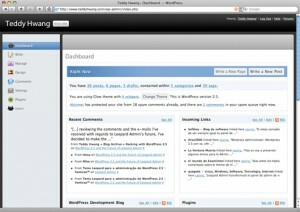 Just search for the ‘Leopard Admin’ at the Plugins Database and you will find this useful WordPress plugin, which once installed will automatically transform the whole backend. Following are a few screenshots of the final looks.